The Up-Rise II 45 Photo Backpack from Vanguard is designed to hold your pro-sized DSLR with an attached 70-200mm f/2.8 lens, grip and 3-4 extra lenses, flash and accessories. Your gear is accessed via a three-sided zipper. Removable, touch fastened dividers enable you to organize the interior as needed. The top third of the bag can be used as a daypack for your jacket, lunch, or other personal items. The rest of the interior is for your equipment. The unique feature of this bag is its ability to be worn either as a standard backpack or used sling-style with its Quick Side Access feature. A buckle releases and connects to the base portion of the bag enabling you to swing it to the front. 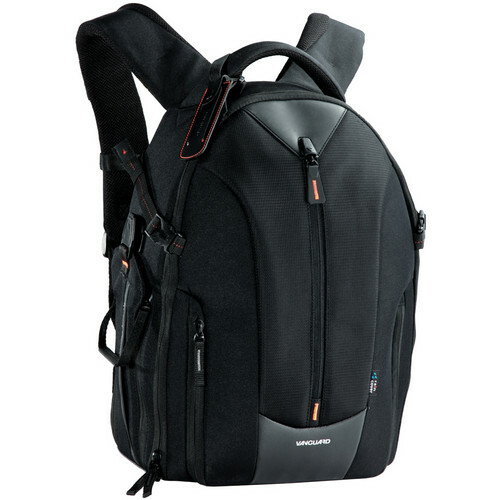 Once configured, unzip the side pocket and retrieve your camera without having to remove the entire pack. An expandable, foam protected side compartment provides more space for gear. This pocket unzips and increases the overall footprint of the pack. 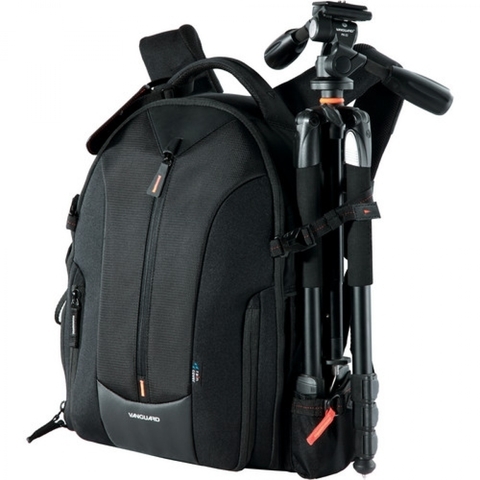 Your tripod is held with a side leg pocket and adjustable straps. Multiple accessory pockets hold media cards, batteries, cables, lens caps, and other small items. An exterior center zippered pocket and D-ring are used to secure and store more accessories. The pack is made from polyester and comes with an orange lining that makes it possible to spot your gear under marginal lighting conditions. Adjustable backpack straps and a sternum strap provide stability while walking or hiking. A top carry handle is for retriving the pack from a car, closet, or luggage rack. The back panel is breathable and provides increased air flow to keep you comfortable while you're on the move. A removable rain cover protects your pack when the weather turns against you.